Can hypnosis really make you more confident to go out and date? It can when you learn to relax and value what you have to offer in a relationship. Hypnosis also has the ability to change negative thoughts into positive ones that lead to more confidence in anything you do. My Dating Confidence Hypnosis MP3 can help! Dating is no easy thing for some people. There is a fear of looking bad or saying the wrong thing – or worse – not knowing what to say at all. Whether you want to start dating for the first time or are starting up again after a breakup, hypnosis can give you the confidence to be yourself and enjoy going out with other people. 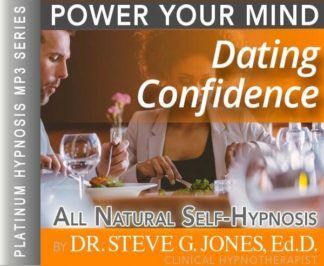 Steve G. Jones, a clinical hypnotherapist, created “Dating Confidence,” a self-hypnosis program that will change the way you approach dating. If you are ready to get out there again, then you can have the confidence in just a short time to make your move – all through hypnosis. Steve G. Jones, Ed.D., Clinical Hypnotherapist, charges $1,500 for a custom recording and $25,000 for a one-hour private hypnotherapy session at his office. But you can get all the benefits for this low price. Simply listen to the Dating Confidence Hypnosis MP3 session every night as you go to bed for three weeks and feel the changes happening in your life. You will feel more empowered, more in touch with your true self, and you will truly know that your goals are within your reach. Steve G. Jones achieves AMAZING and LASTING results!!! Hypnosis is the easiest way to affect change in your life because the positive messages go straight to your subconscious mind effortlessly so you can accomplish your goals and reach for the stars!! All you have to do is listen to the Dating Confidence Hypnosis MP3 audio at night as you go to sleep!!! You’ll hear soft music, the gentle sounds of the beach, and the soothing sound of Steve G. Jones’ voice all working together to bring about positive changes in your life easily and naturally. Steve G. Jones has been helping people improve their lives with hypnosis for over 17 years…now it’s time for him to help YOU… don’t wait, do it NOW !!! you’ll be glad you did. See you at the top! We’ve all been there before. You are interested in getting to somebody. You want to ask someone out on a date. But something is holding you back. Perhaps you are shy, or maybe you think that the other person is out of your league. Or perhaps you’re scared that you’ll make a fool of yourself. What you need is dating confidence! If lack of confidence is keeping you from the dating scene or keeping you from finding Mr. or Ms. Right, then I encourage you to do something about it! By the end of this week you could be on a date with the perfect person, but you’ll never know unless you try! And as you continue to relaxing deeper, deeper and more deeply relaxed, you realize just what an amazing person you are. You are a very powerful, wonderful, beautiful, amazing person. And as you relax thinking about these facts, I would like you now to imagine yourself approaching someone who you’re interested in dating, that’s right. Notice how calm and confident you are and no matter what you follow through, you approach that person. I am giving you a direct command to approach that person. And as you approach them you smile, you are relaxed, your body is relaxed, you are relaxed. Everything about you, the way you look, the way you act, the way you think, all of it is relaxed, that’s right. When you think of dating you think of relaxing. And as you approach this person, you begin talking with them easily and effortlessly. You have prepared something to say. Perhaps, you compliment part of their clothing or something about their appearance. And perhaps you ask for their phone number. You are relaxed, relaxed and at ease. Relaxed and at ease at all times. And they respond positively because they sense your confidence and now I would like you to imagine yourself out on a date with that person, that’s right. Notice how relaxed you are, so relaxed, so confident. You are certain that everything is going to be just fine. You are calm and relaxed, calm and relaxed the entire date. I’d like you now to think of a time in your life when you were very confident and sure of yourself, that’s right. Think about that time now. Imagine yourself there and this could be anything you want it to be. Perhaps you helped someone and you felt good and confident about yourself. Perhaps you graduated or received some sort of honor. Think now of sometime in your life when you felt good and confident and powerful. Make that picture even brighter in your mind now, even brighter. And are there any smells, any odors associated with that event? Remember them now to make this picture even more clearer. What sounds are associated with it? Remember them all now as if you are there involving all of your senses of the memory, make this very clear. Most importantly I want you to remember the good feeling, the good feeling you had, that’s right. And now turn that feeling up a few notches, feel even better, even more confident and powerful, because this is how you will feel every time you approach a dating interest and every time you are on a date and every time you talk to a dating interest whether by email or telephone or in person, no matter how you communicate with that person, you communicate with strength. So breathe in deeply now remembering this event during which you felt confident, the event you are recalling, the event you are seeing and reliving. I want you now to make an OK sign with you right hand touching the tip of your thumb to the tip of your index finger, an OK symbol. And every time you need or want confidence in a dating situation, you will simply make the OK symbol, touching the tip of your thumb on your right hand to the tip of your index finger on your right hand. And this will immediately help you recall that time that you were very confident, that time you are recalling now. So relax, remember your secret weapon, the simple OK sign and that allows you to get in touch with that power, that confidence, that strength, that charisma that you had during that time when you are now remembering. So now see yourself going through the rest of your date relaxed and calm, having a good time, sharing your wonderful unique sense of humor, so relaxed, so at ease. You are truly confident at all times in any dating situation. When you get right down to it, dating is all about confidence. Everyone likes going on a date with a confident person and everyone wants to feel confident out on a date. Also, if you have been rejected on dates in the past, it takes confidence getting back into the dating world. Are you confident enough to approach someone of interest? Do have confidence in your ability to have a conversation with that person? Are confident enough to ask that person out? If you answered no to any of these questions, then you can greatly benefit from the Dating Confidence self-hypnosis program. The Dating Confidence Hypnosis MP3 recording will help you feel confident in any dating situation. It will prepare you to initialize the date whether in person or on the phone. You will feel comfortable asking someone out and saying yes to someone who asks you out. This hypnosis program will also help you meet your dating goals. Whether you want to date casually or find your soul mate, this hypnosis recording will help you have confidence in yourself to meet your dating goals! This hypnosis session will also prepare you to feel and behave like yourself so that your date sees the real YOU shine through. You will feel confident with the help of hypnosis. You will be given powerful suggestions on the Dating Confidence Hypnosis MP3 session. Confidence is a very important quality to have because everyone is attracted to confidence! Listening to this hypnosis session for three weeks will give you the confidence in yourself that you have been wanting. Hypnosis targets the subconscious mind so that you will not over-analyze the suggestions. You deserve to find someone who likes you and appreciates you and this powerful hypnosis recording, Dating Confidence Hypnosis MP3, will get you there!